Why Magento is the best platform for Omnichannel Retail? In the future involved “Internet of Thing” (IoT), people put an optimistic expectation in the technology development and its benefits for every single aspect of life. In Retail Business, savvy consumers, nowadays, place a high value on seamless shopping experience which is brought to them by Omnichannel. And to build up a successful one, Magento is considered an ideal solution for the best platform. Generally, people can divide the profit of Magento Platform for Omnichannel into 2 sides which are eCommerce and In-store experience. The Market Share of Magento is nearly 30%. It means Magento is highly robust, regularly updated and flexible to extend its function to any third party system. Moreover, it also allows tool’s supportation for working and management process such as Google Analytics, Paypal, Mailchimp, Quickbook and so on. Besides, one of the most prominent features from Magento Marketplace is that it’s easy to discovery with high quality. For example, with the friendly interface supporting retailers to discover relevant extensions. It’s simple for searchers to find out top brands and new innovators. They can also look for the customized functionalities, key business categories helping retailers catch up with the newest trend to beat off the competitor. With globally digital marketplace, retailers can trust that all extensions and providers are qualified strictly due to the operation policy of Magento. A Retail Management System streamlines separate sales channels to provide seamless shopping experiences anytime, anywhere. It’s also a great news to know that Magento is highly SEO compatible. Certain extensions existing on Magento Marketplace with the greatest innovation will ensure your site’s search working with a great deal of efficiency. According to Sociable Lab, 62% of online shoppers are influenced by reviews from their facebook’s friends. Magento with the Social feed like Pixlee can support to streamline social media with your site and leverage customers data once they log into any social channel. Specifically, Magento is the truly ideal solution for integrating various forms of social media into a single stream in which retailers are in control along with most of the data that it generates. Referring to Omnichannel means that multiple-channel are running on the process of selling products. And here is the way Magento support Administrations to manage data: They have to use only same back-end to administer all these sites. Magento supports multiple seller accounts, pure ownership of data and products, multi-currency support, real-time tracking of product, inventory control. Thus, this factor will massive interconnectivity as well as strong community presence. A unique experience from Omnichannel to customers is the unified “sense”. Shoppers can see the same content even though it’s displayed on a various channel, the same price as well as the same service and impression which represent the brand position on the tough market race. Differently from the traditional shopping experience, consumers, nowadays, require personalized experience and deeply inside they desire for the brand available presence. With the future involved in “Internet of Things”, Mobility has become more of necessity than a trend. The connection between brands and clients now is extremely tenuous due to the intense competition on market race. This reality leads to the shift in customer behavior and the way brands approach them to maintain customer relationship. And Mobile/Shopping App supports brands to solve this issue smartly, adequately and satisfactorily. With Magento Extensions, customers can leverage benefits of mobile shopping which are payment, shipping method, redeem rewards point and so on. Order Fulfillment is defined as steps involving receiving, processing and delivering orders to end customers. As online shopping was not popular, the main and only method in which retailers finish those steps above is in the physical store. It means, the customers come to brick-and-mortar, choose products, pay and then bring them home. Then, the next revolution called online shopping came and adjusted customer behavior. Shoppers could choose products at home through the internet connection and then shipper would delivery wares to shoppers. However, nowadays, to catch up with the newest trend on market race, a virtual revolution happened and is called as Omnichannel experience. Shoppers now can freely choose among drop ship, buying online – pickup in store, partial shipment, ship from store, ship to store along with others old methods before. It boosts seamless experience for customers and creates new obstacles of managing as well as controlling those process for retailers by the way. Nevertheless, the more shipping methods retailers offer, the more obstacles they may face up within the problem of controlling as well as managing data. Luckily, Magento platform can solve it well by bringing the greatest Omnichannel experience for both shoppers and retailers at the same time. 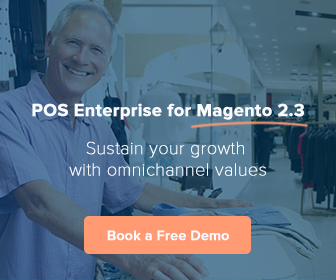 In other words, Magento makes it easier to deliver Omnichannel shopping journey, which creates a connected retail experience across multiple devices, online selling channels, and brick-and-mortar. When retailers sell product on Omnichannel, it’s essential to obtain information about what’s happening on each channel to distribute products wisely. Retailers have to make sure that all products are available for the customer to purchase on any channels in shopping journey. To reach that ideal performance, Cross-channel inventory visibility will supports retailers well. For example, Thomas purchased online an item of sunglasses and decided to pick product in-store. When he came to the nearest one, it would be so delighted as staff could delivery product in a blink. Conversely, if this store runs out of this item, would Thomas have to wait and come back again? So, Cross-channel Inventory Visibility features were developed to solve this problem. Magento supports system to alert staff in case the number of any items is lower than the average indicator. As a result, staffs will have enough time to demand for extra quantities and fulfill storage. What’s more sophisticated, the system from Magento could also suggest the nearest warehouse for staff to demand. It saves time and cost of transportation. In conclusion, to be objective to say, Magento is such an ideally suitable platform for running Omnichannel. What’s operating smoothly with the open source easily upgrading according to the development of business, unlimited functions to use, being able to customize for each specific business type and the core value is that Magento support excellently almost unique Omnichannel’s trademarks.